Bobbin came into my life when I received a call from a lady in town who said she had seen someone throw a kitten out of a car window. The kitten had run under a church and hidden. It was a warm, rainy day when I arrived at the church. I lay on my stomach and looked under the church and saw a pair of huge yellow eyes looking back at me. It took an hour and a half to lure this little creature out of the darkness and into my arms after much coaxing. I took her straight to the vet who told me she would probably not live through the night due to starvation. I had never held a creature like Bobbin before. She felt like bones covered in fur. There was something special about this little cat that made me put all my energy into saving her. I placed her in my bed and began the difficult task of force feeding her a recipe of high protein liquid food through an eye dropper. She didn't seem to respond for the first night. The next day I kept up the feeding and placed a bowl of sardines on the floor since they had a strong smell that might lure her to eat. By evening she had a look that I recognized from other animals that I had tried to save - the look that said she was dying. I was so upset that I began to cry and hold her. I went to sleep holding her, fully expecting her to die during the night. I was awakened by a THUMP in the early morning hours and looked down to see that little creature eating the sardines!! She looked up at me as if to say, "Well, if you're gonna be this upset, I guess I should try to live." That began a six year friendship with a very special friend. I named her "Bobbin" after the children in the movie "Willow" since she was so small. Bobbin slept with me every night and loved to follow the sunshine around the bed during the day. She also loved to sit on the porch and watch the birds. 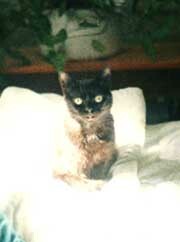 She had some health problems during the years, but was an indoor cat who enjoyed every aspect of being alive. The photo above shows just what a unique little cat she was. She never grew bigger than a kitten, probably due to the early starvation. Bobbin was also responsible for bringing me closer to the man who later became my husband. Homer and I were "just friends" when I invited him over for lunch one afternoon. Now, Bobbin NEVER, NEVER got close to anyone but me. My sister and friends would lie on the floor, gently coaxing Bobbin to come close, but she never got within a yard of anyone! Homer and I were sitting on the screened porch one summer afternoon, when Bobbin walked up to him, jumped into his lap and promptly fell asleep! Homer wondered why my mouth was hanging open and I couldn't speak!! I finally sputtered, "She's NEVER done THAT before!" Homer just smiled. Bobbin obviously knew that Homer was the one I should spend the rest of my life with - even before I did! We lost Bobbin one Spring day when she escaped from the porch and was badly injured by a dog. We had to have her euthanized which absolutely broke my heart. However, in a case like this, I feel that she had six good years that she wouldn't have had otherwise. I'm so lucky that she came into my life and I'll never forget my "little face."